Destin Inshore Charters is equipped with two beautiful 22ft Cape Bay series boats that were built right here in the Panhandle of Northwest Florida. Cape Bay Boats is well known for crafting the driest and softest riding inshore fishing boats on the market today. Both of these boats are powered by strong, reliable Yamaha engines, built for performance but also for sound reduction. From the soundless engine to the sleek design of the bow and hull, everything is made with stealth kept in mind. No more scaring away the fish with big, loud, motors and bulky hulls that clumsily chop up the water. The bow is expansive and provides plenty of room for multiple anglers to cast off comfortably without crossing fishing lines or bumping elbows. There is also plenty of dry storage below deck for all of your valuables so you can focus on the fish biting instead of keeping track of your gear. 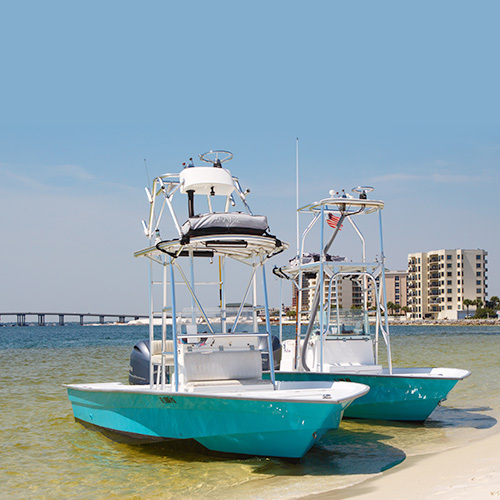 Both of the boats are equipped with custom built towers for sight fishing redfish on the flats or chasing cobia and tarpon on the beach. These boats are made for bow fishing as well, see our other website Destin Bow Fishing for more info! Both of the Destin Inshore boats are also equipped with state-of-the-art electronics from Furuno and Garmin, so even in low visibility, we can keep track of those fish. Our boats are kept very clean and in tip top condition for your comfort. Our crew members clean our boats every single day from bow to stern and we even perform a pre-trip to make sure everything is ship shape before we set sail. Your comfort is our priority, so if you still have concerns or we didn’t answer all of your questions, please don’t hesitate to contact us! One of our crew members will promptly answer your call and your questions, or if they don’t know the answer, they’ll call all hands on deck to track down the answer for you. We are dedicated to making sure that you and your friends and family are comfortable and of course, have as much fun possible catching fish along the beautiful coast of Destin. Our goal is to make you want to come back and see us for more fun out on the water, so come try out Destin Inshore Charters, where the water is nice and the people are even nicer. You won’t be disappointed!